Every home has sockets, whether they are used for kitchen appliances, gadgets or even lights. But what is inside a power socket? What makes them work? In our latest guide, we are looking inside a socket to find out how they work, modern socket designs available, dangers in the home and FAQs from homeowners and electricians. With the number of gadgets and technology in our homes rising, so is the number of sockets, resulting in every home having an average of 4 sockets per room. 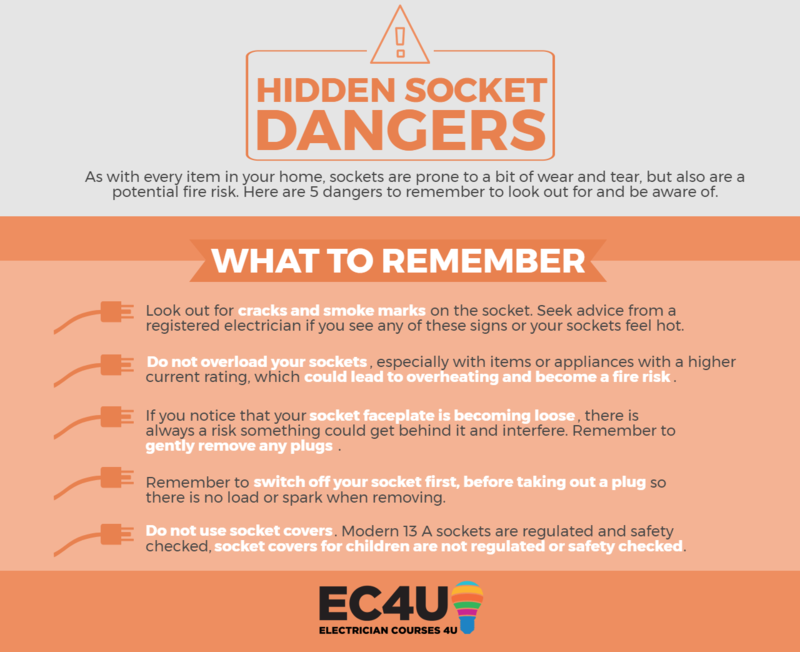 It’s important that you are aware of what’s really inside your sockets and understand how they work and protect you. The wiring of a socket depends mostly of the type of circuit, with the most commonly used socket circuit being a ring final circuit. This circuit means that the cable begins at the consumer unit, before looping around, in a ring pattern, to each socket, before looping back to the consumer unit to form a ring of cable. When you a push a plug, the earth pin at the top is the longest and therefore enters first. As the earth pin is pushed in, the two protective shutters in front of the live and neutral pins are opened, allowing the plug to be pushed in all the way. Once in, each of the three pins connect with their connectors, which are connected to the wiring terminals. New socket designs have built in USB ports, because of the rising number of portable devices. By installing these modern sockets, you can charge more items through the socket and also free up another socket, minimising the need for extension cables. When buying a modern socket, there are just a few things you need to look out for. First, look at how many amps each USB outlet is rated at. It’s important that your socket has a strong enough amp rating to charge your gadgets quickly and efficiently. iPads and other tablets normally need a high amp rating of around 2.1 amps. However phones will only need around 1.0 amps to charge efficiently. For this case, it is best to look for sockets that have a USB rating of 2.0 amps. Next, only buy from a reputable retailer, like B&Q, Wickes and Screwfix, to ensure they have been tested and are of a high standard. Don’t be tempted by cheaper unbranded alternatives online, as it may not have been safety tested and could be a fire risk in your home. By installing a protected, outside socket, you are removing any trip hazards and any risks that come from using an extension lead outside. They do not take long to install, but you first must decide on a suitable location, so that the new outside socket backs onto an existing internal socket to easily share the power. Then drill through the wall to the outside location and connect the cable between the two sockets to extend the power supply. As it is an outside socket, you must remember that the enclosure for the socket must have an appropriate IP rating, so it is protected from a variety of weather conditions. It is also important to make sure the new outside socket has sufficient RCD protection, which it will have if the house has been wired after 2008. However, if it hasn’t, you will need to use an RCD protected outside socket for maximum protection. As with every item in your home, sockets will understandably experience some wear and tear. 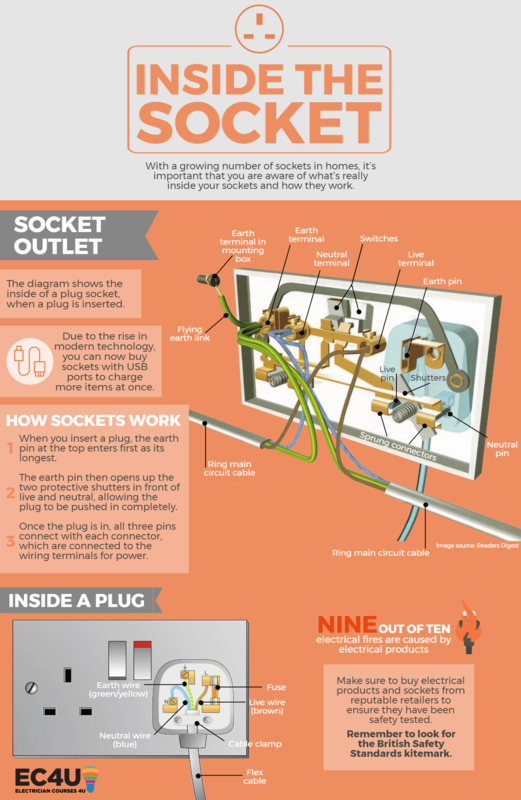 Here are 5 potential dangers with sockets, and also important safety points to remember. Look out for cracks, smoke marks and signs of arcing on your socket, as this could be a sign of something more sinister lurking in your sockets. Seek advice from a registered electrician if you see any signs of smoke or the socket getting hot. With technology advancing, it means that our sockets risk overloading with gadgets. Currently 19% of UK homes are already showing signs of electrical overload in their sockets. Make sure you are not plugging in too many items, especially those with a higher current rating, which could lead to overheating and become a fire risk. If you’re sockets are overloaded, get additional sockets installed to help balance the load. If you notice that your socket faceplate is becoming loose, there is always a risk something could get behind it and interfere. When you pull out plugs harshly, this can lead to damage to the faceplate and it becoming loose. Gradually over time this means that the screws become loose. Remember to tighten up the screws over time and gently remove any plugs. Remember to switch off your socket first, before taking out a plug so there is no load. Commonly people will not switch the plug off first and see a flash, but this can be stopped by simply turning off the switch first. Our modern, UK 13 A sockets are safest without any intrusion and are safety regulated too. Socket covers are not regulated and are not needed for protection. My socket front is cracked and damaged. Can I replace the front or do I need to call an electrician? If your socket cover is cracked or damaged, it will need replacing. Homeowners can change socket front without the need for an electrician. However you will need to safely isolate the circuit first, so that no one turns it on while you are working on it. Are sockets with USB ports better? Socket outlets with USB ports allow you to use more items at one time, without the need for an extension cable. For this reason, many believe they are better than regular sockets. Whether they are better is dependent on a few factors, including the brand and how many amps the USB ports have in them. I turned on an appliance and it tripped the power in the house, what should I do? The Residual Current Device (RCD) on your consumer unit trips to protect you from any faults. If a particular circuit breaker continues to trip, it is best to call a registered electrician to come and inspect the circuit for any faults. What is the best way to check for polarity of a socket outlet? When testing for polarity, you should test through the front of the socket outlet with an adapter, not through the back of the socket with probes. There is a missing circuit conductor. What do I do? Do a visual check with the power off, then you need to trace the conductors to the adjoining outlets and see if you need to run a new one. I’ve opened the socket and found 3 conductors in the back of the socket. But I can’t find another socket which has single connections. This is a spur that has been interconnected into the ring. You need to find another socket with 3 connections, and you may have a ring within a ring. This is a very dangerous situation. Best procedure is to disconnect it and either create a fuse switch connection spur or integrate it properly into the ring circuit. If you want to find out what happens inside a lighting circuit, then read on!